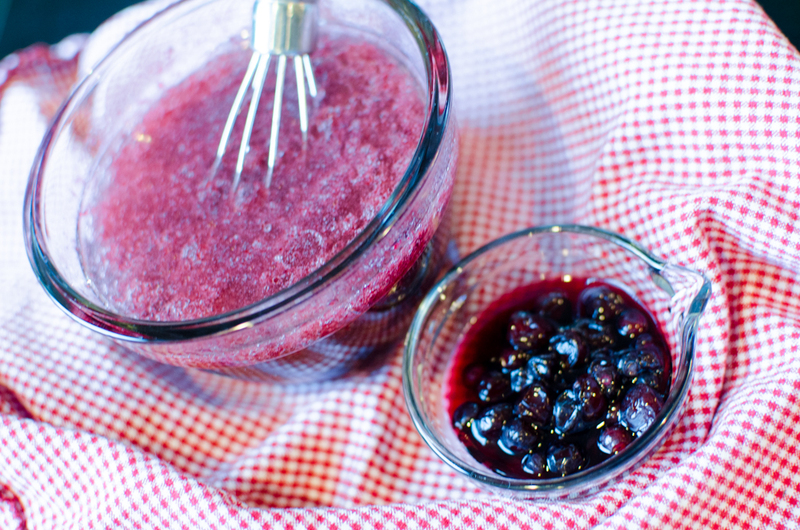 In a small food processor, mix the huckleberries, honey, vinegar, and salt. Pour the mixture into a bowl and then whisk in the olive oil. The mixture will separate as it sits so just make sure to whisk it up before putting on your salad. Huckleberries. You would think they are made of gold. They seem to be a hard commodity to obtain and are coveted by those who seek them. It is no wonder the going rate on average is $40/gal. Allow me to explain. Here in the NW you have to go hiking up high in the hills where they grow and their season seems to be relatively short as with most berries. One may also need to fight off a bear or two as bears enjoy their fresh taste as well. You see plenty of signs in North Idaho advertising huckleberry shakes, huckleberry pie, huckleberry cobbler, huckleberry muffins…you get the idea. No lack of huckleberry desserts that is for sure! On our recent trip to ID to visit family, it was way too hot to hike and pick huckleberries in 100-degree heat so we chose to support the local huckleberry picker instead. It is worth it. But instead of making up a dessert, although the idea is not completely lost, I decided to make up a vinaigrette for my salad instead. I also got the opportunity to use some red wine vinegar that I made myself! Thanks Karen this sounds really good and I will share with my lady friend and Valentine. Now to mooch some huckleberries off my Native friends or go wrestle some bears. Yum, yum! Sounds great Doug! Great to hear from you! Thanks for checking out the blog!